It's the season for pie. Every cooking blog I read is either featuring pie, holiday cookies, or cakes, and they all involve pumpkin! Two of my other foodie friends have also posted their attempts at a flaky pie crust. All these delicious posts got me thinking about trying my hand at baking a homemade pie. I haven't been baking as much as I used to, since I've been busy doing homework after dinner is over. My usual baked goods are quickbreads (banana, zucchini), cookies, and a few tasty apple cakes. I can't remember any time that I made my own pie crust from scratch. So this was an adventure! Next time I'll need to be a little more precise in my measuring techniques - it all worked out fine - but could look prettier. It tasted great! 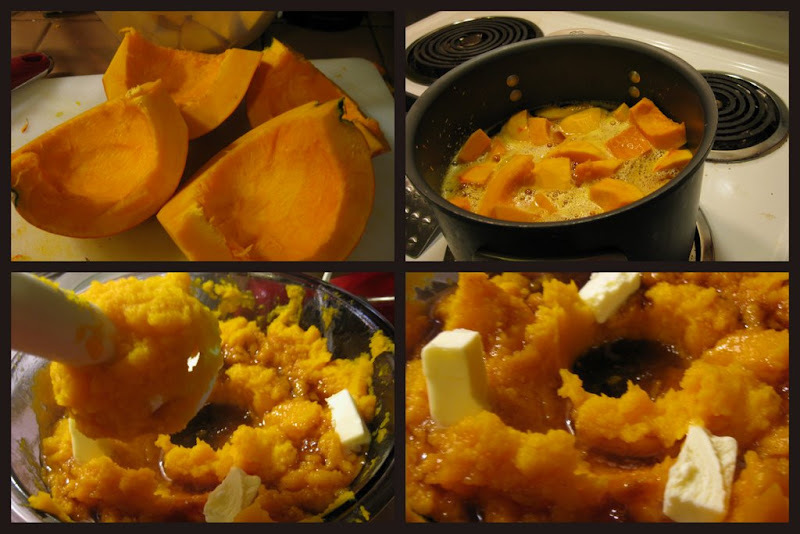 Back in October, I made a maple kabocha squash puree that I thought would be great as a pie filling. At the farmer's market, I picked up some red kuri squash at the Atlas Farms booth. I don't like overly sweet desserts, so this filling might be a little savory for those of you with a severe sweet tooth. I also didn't make a traditional custard-like squash pie filling (like a pumpkin pie). Next time I'll add in an egg and some liquid so that the filling stays together a little more. I forgot to write down the measurements for the spices - adjust as you see fit! If your local farmers don't have red kuri squash you could also use kabocha, butternut, or the smaller pumpkins. I won't re-type this pie crust recipe, I'll point you to the blogs where I read about this great recipe. You can visit Delicious Dishings or Playing House for the link to the recipe. I will say that the secret to this flaky crust is chilled ingredients - especially the ice cold vodka. I used what I had in the freezer - guess I should call this Absolut Squash pie. You can't taste anything but the flaky deliciousness after baking. There is a reason that people go to culinary school to learn how to make pastries! I had a blast making this, but I definitely do not have the pastry patience! A few notes on my pie crust preparation. First, after all this cooking I still don't have a large food processor. This means that I either process in small batches or I turn to my immersion blender. For this recipe, I'm sure that my immersion blender method affected my dough mixing success. It still came out great, but it was a little unwieldy to work with. Second, I have a great rolling pin but nowhere to roll out the dough. I improvised and taped down a huge sheet of wax paper to my countertop. Next time - a silicone mat! Thankfully I had two balls of dough to work with (the recipe is for a double crust pie). The first didn't roll out very nicely, so I turned it into lattice strips for the top. The pastry gods were looking out for me - the second ball of dough rolled out much nicer. I spent about ten minutes looking at the rolled-out dough and trying to figure out how to get it into my pie plate. I know that a lot of cookbooks advise folding the dough into quarters and then unfolding into the pie plate. My dough was a little wet so that was not an option. I ended up untaping the wax paper and flipping the dough into the pie plate. Did the trick! Third, a rustic looking pie tastes just as delicious as a perfectly precise presentation. I probably should have prebaked my crust for extra flakiness, but my pastry patience was running thin. I scooped in my chilled squash filling and laid my free form lattice strips on the top. I brushed the top with some egg white wash and sprinkled cinnamon sugar on top. Then, into the oven to cook. After about 30-35 minutes the outside was starting to get a little dark, but the bottom wasn't quite done. I made some aluminum foil 'crust protectors' so it wouldn't burn and continued to cook until I thought the bottom was done (another 15-20 minutes). This pie was the perfect level of sweetness for me. Delicious, flaky crust. Smooth, maple squash goodness. I had a hard time not eating the whole pie by myself, especially since I was home alone. I'm sure my co-workers are glad I controlled myself! This pie crust will be making another appearance for holiday baking. I'm calling my grandma to get the recipe for her pecan pie filling to add to this crust. Maple syrup, cinnamon, and squash - that must have made for a mouthwatering filling. I found the pie crust a little difficult to work with too and had to keep refrigerating it, but it eventually stopped being stubborn and cooperated with my attempts to roll it out! I am so impressed that you did lattice! I haven't attempted that yet. P.S. I saw one of those pie crust covers so the edges don't burn and now I kind of want one.